This title is an authoritative resource on the science and technology of the postharvest sector with an emphasis on the biochemical and molecular aspects relevant to each topic with postharvest implications. An increased understanding of the developmental physiology, biochemistry, and molecular biology during early growth, maturation, ripening, and postharvest conditions has improved technologies to maintain the shelf life and quality of fruits, vegetables, and flowers. Postharvest Biology and Technology of Fruits, Vegetables, and Flowers provides a comprehensive introduction to this subject, offering a firm grounding in the basic science and branching out into the technology and practical applications. This title is an authoritative resource on the science and technology of the postharvest sector with an emphasis on the biochemical and molecular aspects relevant to each topic with postharvest implications. Coverage includes the developmental physiology, biochemistry, and molecular biology during early growth, maturation, ripening, and postharvest conditions. 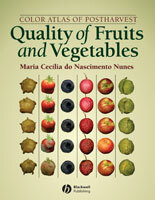 Overall, the book covers several topics that are not normally dealt within books dealing with postharvest science at present. An example will be that chapter on membrane deterioration. The importance of membrane preservation and thus maintenance of membrane compartmentalization is a topic that has been dealt with for over 20 years. It is difficult to find a book that deals with this topic at present. In addition, we have also described the technology of membrane preservation through the inhibition of phospholipase D, the key enzyme that initiates membrane phospholipid degradation. Phospoholipas D inhibition technology using hexanal shows great promise and may serves as a widespread technology for the preservation of organically grown horticultural produce.